The written form of a composition for orchestral or vocal parts. 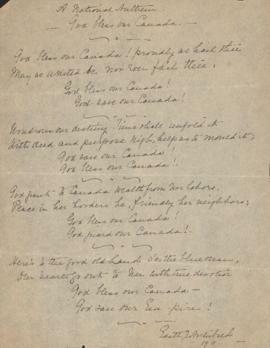 Item is a manuscript of Edith J. Archibald's song for solo voice and piano in F Major entitled "A Nocturne," including the score and a separate typed sheet with the poem in English and French, also written by Archibald. Item is the score for Sandy Moore's seven-minute composition, "Artnam" for bass clarinet solo. Item is a copy of Paul Cram's composition, "B-flat Restaurant," dedicated to Don Palmer and composed for a SOCAN grant in 1993. The music is handwritten in common music notation and features long and frequent solo sections. Item is a copy of Paul Cram's composition, "B-flat Restaurant Redux," which reuses elements from his "B-flat Restaurant" composition. The score, written for C instruments, is type-set. File contains two copies of the score for Sandy Moore's composition "Broken Chains" for flute, alto flute, alto saxophone, percussion, harp, piano, and hand clapping. Item is a copy of Paul Cram's composition for three parts. The composition is in three sections with the first in 15/4 and the last two in cut time. 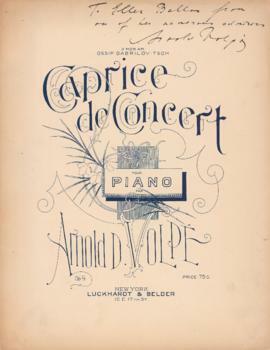 Item is a copy of Volpe's Caprice, dedicated to his friend Ossip Gabrilovitsch, and published by Luckhardt and Belder of New York. Item is a copy of a four-part anonymous composition entitled "Caravan" in 4/4 time. File contains a copy of Paul Cram's composition in six sections, including a pssacaglia and canon. Item is a copy of a handwritten piece called "Chipper," by Don Palmer. The piece is for solo alto recorder with harp, flute, clarinet, Flugal horn, and bass clarinet. The piece is in C Major and has a 3/4 time signature. File contains three annotated copies of the score for Sandy Moore's composition "Clustrix" for piano, electric guitar, harp, bass clarinet, horns, and cymbal. 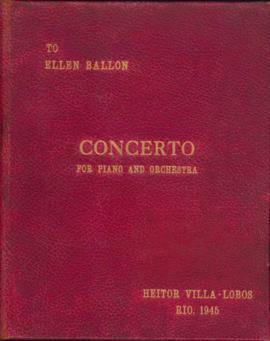 Item is the bound manuscript of Heitor Villa-Lobos' first piano concerto, dedicated to Ellen Ballon. 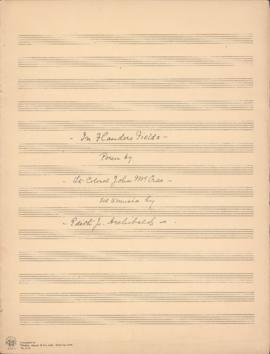 Item is a complete orchestral score of Heitor Villa-Lobos' first piano concerto, dedicated to Ellen Ballon of New York. Item is a copy of Paul Cram's composition, "Evil Vamp," which includes a "polytonal" and "dirge" options for improvisation. 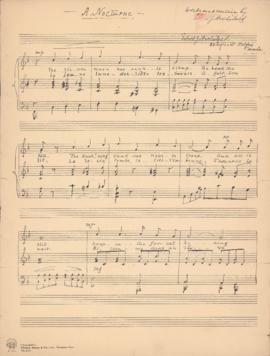 Item is a manuscript of Edith J. Archibald's song for solo voice and piano in C Major entitled "Exiled: A Serbian Lament." 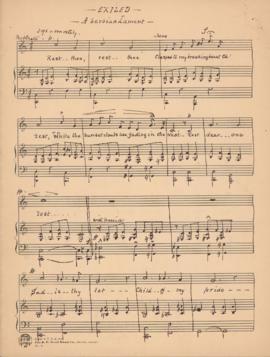 A separate author for the lyrics is not indicated, so they are likely also written by Archibald. File contains a copy of the B-flat and C instrumental parts for an anonymous composition entitled "Fantasy Island," handwritten in common music notation with a 4/4 time signature. Item is a copy of Steven Naylor's composition for guitars, accordion, wind instruments, and keyboard. The score is in graphic notation, using coloured symbols in blue, green, and red to indicate duration, pitch, attitude, and stops. File contains four annotated copies of Jeff Reilly's composition, "Flight 753" in piano score format. The composition is a shortened version of "Flight 752." File contains the bass clarinet, bassoon, oboe, cello, and piano parts for "Flux Latitude" by Dimoff, written in pencil. Item is Paul Cram's composition, "Forming 23," a graphic score for trumpet, trombone, guitar, piano, bass, drums, and vibraphone. The score includes indications for ornamentation, rhythm, style of improvisation, tempo, and register. 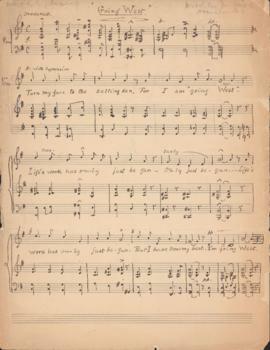 Item is a manuscript of Edith J. Archibald's song for solo voice and piano in G Major entitled "Going West." 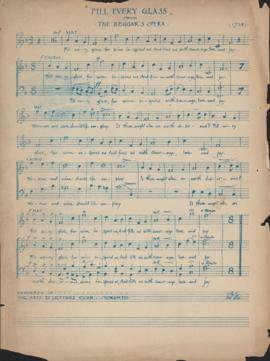 The text for the song was written by Rev. Mrs. Ross(?) of Hamilton, Ontario. File contains two annotated copies of Paul Cram's composition, "Hum over the Horizon," for piano and solo instrument. Item is the first two lines of Paul Cram's non-metric composition. File contains two annotated copies of Paul Cram's composition, "Kickers," in five parts. Each of the five parts is a short phrase. The composition was funded by SOCAN. File contains two annotated copies of Paul Cram's composition, "Les Mouton à L'Abbatoir," an atonal composition funded by SOCAN, which consists of a monophonic melody. File contains the E-flat and B-flat parts for Paul Cram's atonal composition, "March of the Philistines."